TS ECET Exam Syllabus 2019 is updated here. The candidates who applied for Telangana ECET 2019 can check TS ECET exam pattern and syllabus. So students who are preparing for the Engineering Common Entrance Test can download TS ECET Syllabus pdf from our page. Telangana State Government released ECET Notification to fill vacancies in various Engineering, Pharmacy colleges. A huge number of candidates applied for ECET exam 2019 to seek admission into 2nd year of B.Tech courses. Most of the candidates are searching for TS ECET Exam Syllabus. Therefore for the candidates like you, we are providing TS ECET Syllabus 2019. Engineering, B.Sc (Mathematics), Pharmacy stream syllabus is available on our page. 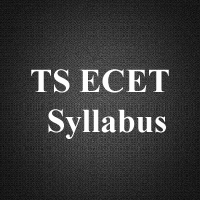 The ECET Syllabus is the main thing to appear for TS ECET exam 2019. With the ECET Syllabus 2019, you can prepare for ECET exam quickly. As the syllabus is different for various streams, you can find streamwise TS ECET Exam topics on our page. We are providing the direct link of ECET Exam Syllabus. So the interested candidates can download ECET exam syllabus and TS ECET Previous Papers. Name of the Organization Jawaharlal Nehru Technological University, Hyderabad. Exam Name Engineering Common Entrance Test (ECET). As the exam pattern for TS ECET differs for different streams, the candidates can check their respective stream exam patterns in the below tables. As the syllabus varies for each stream in Engineering, we are providing streamwise TS ECET Exam Syllabus. So the candidates who are searching for the Telangana ECET branch wise syllabus and exam pattern here. Then what are you waiting for? Quickly go through the following sections and download the syllabus for Telangana Engineering Common Entrance Test. Steam Boilers, Turbines & Nozzles. Engineering Materials & Solid Mechanics. Welding, Forging, Foundry and Conventions in drawing. Data Communications and Computer Networks. Geology and Mineralogy of Ceramic Raw Materials. White Ware & Heavy Clay Ware. Energy Technology & Plant Operation. Environmental Studies and Pollution Control Engineering. Methods of Working – Coal. Mine Environmental Engineering – 1. Mine Environmental Engineering – 2. Mining Legislation and Mine Management. Molecular Biology – Genetic Engineering. Industrial electronics and control engineering. Communications and Linear IC Applications. The Syllabus for the streams of Pharmaceutics, Pharmacognosy, Pharmaceutical Chemistry is available in the below section. Drug Store & Business Management. Hospital Pharmacy & Clinical Pharmacy. For B.Sc Mathematics, the subjects in the TS ECET exam are Mathematics, Analytical Ability, and Commutative English. Therefore, We are providing the subject wise ECET 2019 Syllabus for B.Sc Maths below. Normal Subgroups and Factor Groups. Rearrangement of Parts in Sentences. The Telangana State ECET Syllabus for different streams are provided. Therefore, the candidates who applied for TS Engineering Entrance Test can download the TS ECET Syllabus Pdf. Visit the official site for more details about TS Engineering common Entrance Exam 2019. Water technology is given twice . Syllabus is given,but chapter wise weightage is needed. Pls gove the weightage also. How many marks to qualify in E-CET EXAM PLZ SEND…. Syllabus is given,but chapter wise weightage is needed. Pls give the weightage also. even i had same doubt!!! Please give the weightage of marks for all the engineering subjects sir..
Actually civil engineering has 9 subjects, then why there are only 6 subjects here? do we have only 6 subjects??? Transportation engineering subjects are those deleted from syllabus….